Abby & Milo: Milo was Bitten by a Donkey... Yes, a Donkey. Last Thursday I took Milo for a walk and went by the little farm near our house that we always go by to see the little donkeys that live there. 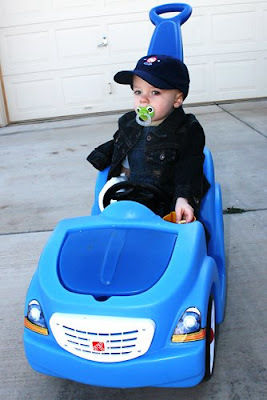 I had put goldfish crackers in cup holder in Milo's little push car he rides in so he could have a snack. He had been munching on the goldfish but I didn't know that he had one in his hand still when he got to the donkey's fence. We pulled up next to the fence and the donkeys come over and we start petting them and I fed them some goldfish. Before I realized what was happening Milo was offering the goldfish I didn't know he had in his hand to one of the donkeys and the donkey took it and bit Milo's finger in the process. Milo starts screaming and I pinched the donkeys jaws to make him let go and there is blood everywhere. I carried Milo back to the house two streets away and called the doctor who says since it's still bleeding and starting to swell I needed to take him to the ER. Chris and I loaded our screaming son up and headed off for the ER and when we get there they ask me what's wrong. I say "my son was bitten by a donkey". "Are you joking?" the nurse says. "No, I'm not joking" I say thinking, seriously, my son is screaming a clinging to me and you ask me if I am joking? To make a long story short the donkey striped some skin off but, thankfully didn't break the finger. They soaked his hand in Bedodine (sp? ), wrapped it up and gave him an antibiotic prescription. Now that I have some distance from it and Milo's not seriously hurt and is no longer bleeding and screaming I can see that it is a little funny that my son was bitten by a donkey of all things. At the ER he was their first ever donkey bite victim! 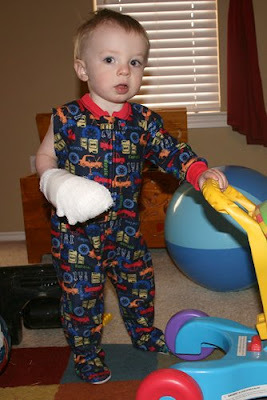 We had to cut off the arm of one of his pj's to accommodate the big ol' puff ball they put on his hand in the ER. He had to wear it for 24 hours but he torn it off while he was supposed to be taking his morning nap Friday morning. I wrapped it up in an ace bandage after that. He played happily most of the morning despite being one handed. I took him on a "drive" by of the donkey paddock to help him start to get over any fear he might have. We pulled up next to it (but not too close) and he was wary but did fine until the donkey came up to the fence and then he started to whine and try to climb up in my lap. We backed off to the other side of the road after that and watched them for a little while. He even smiled a little at that distance! I think if we just keep going back (with out goldfish mind you) and taking slow my little trooper will conquer his fear! The culprit. Looks menacing doesn't he? I think my last comment didn't post, so anyway, I said Poor baby! That's insane! My goodness! I totally identify with the one-handed thing. Poor Milo. I'm glad he's getting over his fear. I can't help but laugh, what are the odds??!? But I am so glad he is okay! How scary! A donkey?! Our family never does anything normal! Did y'all get the gifts we sent? So glad he is OK! Stay away from donkeys!!! OMG! We walk to donkeys and mini pony's and emu's in the summer because it's about 7 blocks from our house and our neighbors son was bit by an emu but nothing that sever, I alway bring carrots or apple that are about to go bad and let my daughter give them the carrots but well now I'm not so sure lol! 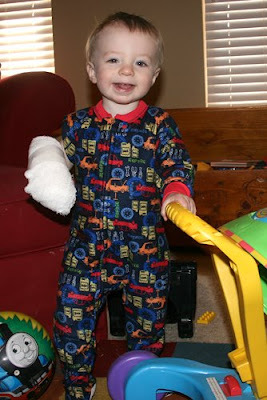 I hope his hand heals fast! Ok...owning 2 donkeys I laughed outloud at this one. That is way funny once you're on the other side of it. But having a "close call" and making an ER trip not to long ago over Garrett's head I HATE the panic mode it puts you in when the blood starts flowing. 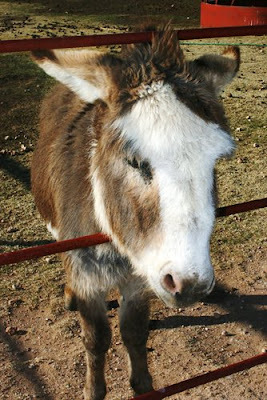 But...as I said, as owners of donkeys it is funny and the pic of the menacing donkey is even funnier. I know how it happened too cause Garrison and Aubrey have both been bitten more than once giving Fletch an apple...and of all things a Sonic cheeseburger. Don't try that with finger loving donkeys!!! They LOVE those and the fingers forking them over!!!! LOL!